You might see their representatives at community events, clipboards in hand, waiting to talk with people going in and out of supermarkets or government buildings. At other times, they organize informational forums or go door to door. They’re organizations that focus on building a bridge between Latino immigrants and the social, political and financial structures of the U.S. that are often unfamiliar to those who have just arrived to the so-called land of opportunity. 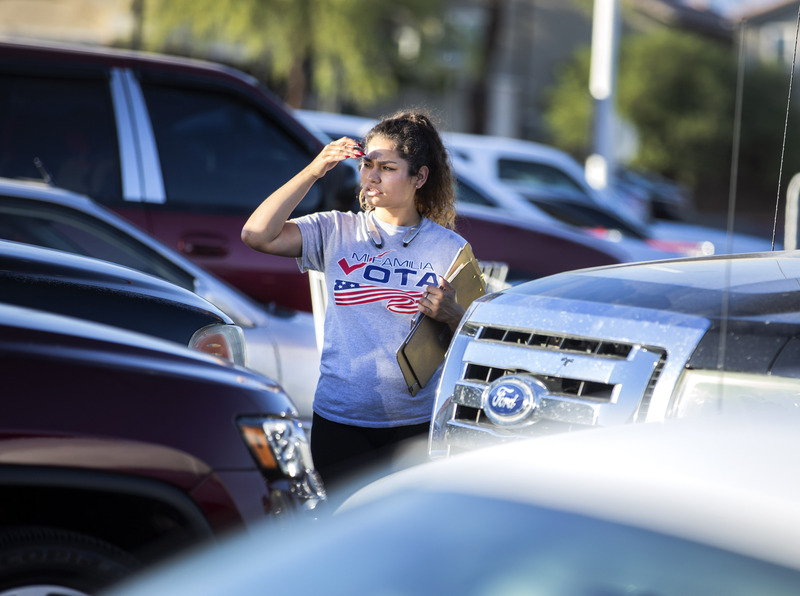 Although they have different ideologies and platforms, these organizations share a common goal: To reach out to a Latino community that — while considered a pivotal political force in Nevada — also has needs they say are often overlooked. Data from Census Bureau show that the population in the U.S. is steadily becoming more diverse, with nearly 58 million Latinos residing in the country in 2016. Latinos are the second fastest growing ethnic group in the nation, growing by 2 percent from 2015 to 2016 compared with a rate of 3 percent for Asians, according to the Pew Research Center. There are an estimated 387,000 Latinos eligible to vote in Nevada; they make up 19 percent of the eligible voter population. Many Latino-focused outreach organizations also believe that as the Latino population in the country grows, there’s a greater need for more Latino representatives in high-profile positions. 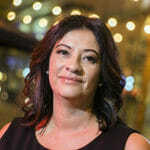 The Nevada Independent en Español is sharing interviews with leaders from two prominent Latino outreach groups that have been active during election season and beyond, seeking their perspective on the Latino vote and what drives their work. First up: Ben Monterroso, executive director of Mi Familia Vota. The following interview has been edited for brevity and clarity and translated from Spanish. Answer (A): Mi Familia Vota was created in California after Proposition 187 was created by Republican Governor Pete Wilson. That proposal tried to eliminate health services for children born in the United States whose parents were illegal immigrants. That measure failed — voters approved it, but a court found it unconstitutional. That’s when we saw a reason to do something to end these attacks on our community, and the only resolution we came up with was that the only way we could finish this was by building political power, because we could no longer leave the future of our community in the hands of politicians who don’t listen to us, nor leave it in the hands of the courts. So the only way to solve the problem was to take responsibility and put the future in our hands and shape voters that will change the political system by electing candidates who best represent our community. That is where Mi Familia Vota comes from. I think that after many years I’m pleased to say that many people say “California changed.” No. We, the voters, made California change, so it’s improving, but it didn’t do this alone. Is it perfect? No, we have to keep fighting and participating … And that’s the mission — to build political power so that elected politicians legislate issues that concern us and help our community. Q: How long has Mi Familia Vota been in Nevada? A: We arrived in 2010 and since then we have continued to work to motivate our community to participate. Q: How does Mi Familia Vota know which topics interest Latinos in Nevada? A: We asked questions in our community and that is why some issues we have to address every year … We knew that the immigration issue was very important to our Latino community; education, access to health care, and the environment. Sometimes there are specific issues of a city or a state that we also discuss, but we try to teach our community the importance of these four issues and that politicians must do something legislatively to address those. Q: What changes has Mi Familia Vota noticed in terms of Latino participation in the polls, and in general? A: We have seen the number of people who have registered to vote … and the number of [Latino] legislators in Nevada has grown. I think we don’t have complete representation, but that’s where we see progress. We have candidates and politicians … that understand and speak like our community does. That’s how we see that voter participation has created more politicians who look like our people. Q: During 2016 elections, which strategies worked for Mi Familia Vota and which didn’t? A: I think what worked better was there was a strategic approach to ensure new voters register, or re-register, because sometimes what is taken for granted is that people often move from one place to another. I also think that in 2016 enough efforts were made to … make sure we talk to our people. We can’t wait for the community to participate if we don’t provide information, and more importantly, if we don’t invite them to vote. Our people won’t vote just because they have to vote. Our people still need to ensure they have information. I think those two things worked as a strategy in 2016, in addition to the fact that we had a presidential candidate who was insulting our people, and this is something that we can’t just push aside. Q: What changes will Mi Familia Vota have to implement in their strategies to engage Latinos in politics during this year’s elections cycle? A: I think that first we need to improve what we did. I don’t mean we didn’t do a good job in 2016, considering how many more people we have to register, but there is also something that’s very important this year — young Latinos. We need to ensure the community is involved, that they understand and see their participation as something that’s necessary not only for them but for the entire country. We must also ensure that we have a closer encounter with young people through the media outlets they know best, to communicate via social media, that we speak the same language and listen to their requests. And this has been happening for the past few weeks. It’s not only for a moment, but it has to be a movement that leads to the polls. Q: From your point of view, what are the differences between the Republican, the conservative and the progressive electoral strategies? A: Strategies are messages and plans. What I’m talking about is to make our community become a voter community that participates, I think we need to properly inform them, and not only motivate votes to be emotional votes, but to be rational votes. Sometimes we see campaigns trying to misinform and discourage our people to participate, and I think those are the ones that do damage. I think the best approaches are those that talk about issues and the solutions they will offer for those issues. So, I think the difference is in the messages they send. Some are hopeful, others are confusing and discouraging. I think that’s where we as a community and a non-partisan organization have a responsibility and a very big job to do. Q: From your point of view, is it true that Latinos don’t vote? A: The number of Latinos that have voted hasn’t been the same as the number of voters from other communities, but also the investment hasn’t been the same as in other communities. We have to make a cultural change in the Latino community. I mean, unfortunately for migrants, politics — from Mexico to Argentina — haven’t worked, but also politics in the United States, from San Diego to the border of Canada — haven’t done us any favors. We have another problem — we’re young, and not everyone is registered to vote. I would say at this point that 45 percent of Latinos who are eligible to vote in general aren’t registering, so we have to work with them. Of those who are registered, 85 percent vote. The problem is that we have to inform them, motivate them and invite them. It’s not just that it’s a right and a responsibility, although that is true. Our community hasn’t been approached in a culturally appropriate manner that can motivate them to vote. Hence the work Mi Familia Vota does. We do four things to build political power: First, our campaigns are all year round. We aren’t going to leave after the election ends. Many campaigns do that. Number two: We ensure all year round that we register new voters, those that have changed their address, young people who turn 18, and we encourage the community to become citizens. We believe that if we make the electorate grow, we will have different results. Third, we make sure we work in coordination and to maintain a presence throughout the year, because it’s not just about choosing candidates, it’s about demanding candidates do their job. If they’re doing this, obviously they will be rewarded with votes in their favor. Fourth, what I think should be done to change this apathy is to develop leaders at the local level. It’s a lie that a campaign that comes every two years to generate votes creates leaders. We must build leaders that can run campaigns and organizations such as Mi Familia Vota, and leaders who can run for office. Those are the four bases that we are working on. Unfortunately, this costs money, resources, time and investment, and this usually doesn’t happen all year, and if it does happen, it’s with a few resources and that makes the job harder. Q: What is the position of Mi Familia Vota regarding education, immigration, including the construction of the wall and DACA? A: We are in favor of a fair and comprehensive immigration reform. What do I mean? That people who are undocumented in this country will have the opportunity to get legal status. We know they already separated families and we want them to be reunited. We are in favor of a resolution as soon as possible for DACA, without also forgetting that this president canceled TPS (temporary protected status). To add more resources to try to build a wall, or to add more ICE agents to continue deporting our people, I don’t think that’s the best way. We are against a wall, because it’s just hatred and racism; that’s all it represents, because it won’t fix anything. We support access to a quality education that is accessible for our community. I’m not just referring to kindergarten through the 12th grade, but beyond that. We must recognize that our Latino community in a few years will be much larger in the United States and we will have the responsibility of leading this country. As far as health care is concerned, we must ensure that there is quality access and that people can afford it. Finally, the rights of workers. We believe they are entitled to have their own representation, to have a union if they want it, but beyond that, that they will earn enough to have a decent living and benefits. Today we can’t get sick because if we get sick we don’t pay the rent. Q: What is the ideology of Mi Familia Vota — conservative or progressive, Democratic or Republican? A: I don’t think the MFV is either Republican nor Democrat or liberal, or anti. I think the issues affecting our community, whether it’s health care or education, aren’t progressive, these issues are realistic. I think that politicians make it, unfortunately, become Democrat or Republican, because today, those who are in favor of an immigration reform say they’re Democrats, but why does this have to be Democrat, if the reality of things is that us immigrants have helped and are helping this country grow? What we are asking for is justice, so if only Democrats are going to have justice, we will lose Republicans that don’t think they have to fix the issue of immigration. So, I don’t think MFV is progressive or radical, I think that what we want are solutions to our problems. That’s precisely why MFV doesn’t endorse or support candidates, we support issues and candidates that are in favor of those issues. Obviously, if they attack us with walls, if they attack us with everything else, we aren’t against the party, we are against all those who are in favor of that. And if all of them are Republicans, I’m very sorry. Q: This isn’t a presidential election year. What will MFV do to encourage Latino voters to participate? A: I think the 2018 elections are entirely new for many organizations, including MFV, and I’ll tell you why. I think the issue of politics isn’t discussed much in our Latino community, but when President Trump launched his campaign insulting our Latino community, I think our community began to pay more attention. So, what are we going to do differently? We are going to ensure that our people realize that elections have consequences, that we have a chance to change those consequences, that our vote on Election Day is as powerful as the millionaire or billionaire in this country and that there are more people who don’t have millions of dollars that can vote and change the course not only of this nation, but in favor of our community. So, I think that will be the motto, to keep talking to young people, to continue to make sure that our people don’t say “I don’t care.” No … I think that since the campaign began in 2015, many people have realized that the political consequences of not voting are great. Some have lost relatives, benefits, some are frightened by what this government is doing and what we need to understand … is that we will continue to provide information, that in their hands lies the power to make a change for this country and for our family.